The Royal Montreal Regiment Foundation is embarking on an ambitious fundraising campaign to help dramatically expand the RMR Museum into a first-class community educational resource. This First World War Education Centre will tell the story of Montreal’s French & English communities participation in the First World War: proving how Canadian ethics turn ordinary citizens into our extraordinary heroes. The expanded museum will commemorate the sacrifices and celebrate the accomplishments of humble everyday people who rose to the challenges of war – and will be easily accessible to the general public, with a particular focus on being an interactive online educational resource for schools. You or your organization can help support this endeavour by purchasing a Commemoration Tree: a cultivated six-foot high Canadian Sugar Maple tree with root ball. The tree comes with a personalized plaque, which will be installed in a park in of one of the RMR’s affiliated cities. For over 300 years, the maple leaf has served as Canada’s national symbol, and forms the central part of The Royal Montreal Regiment’s badge, symbolizing commitment and dedication to Country and community. Transportation, planting, and eternal replacement (if required) is included in the cost, and donors will receive a receipt for income tax purposes. We encourage people to set-up online Giving Pages (step-by-step directions below) to help crowdsource their commemoration tree(s) through groups, associations, etc. Why now, why the RMR? The RMR was formed for serve in the First World War by bringing together soldiers predominantly from three leading Montreal Militia units: two English and one French. As unremarkable as it may seem now, it was a radical idea in 1914 and one that proved exceptionally successful, and as such the RMR is in a unique position to be able to properly tell the story of Canada’s participation, as its members were drawn from all corners of the country, with the nucleus being formed from Canada’s economic, cultural, and social capital in 1914: Montreal. The value of properly telling the RMR’s story is that is reminds all Canadians of the strong ethics that turns ordinary citizens into our Country’s extraordinary heroes. The story of the RMR is that of humble everyday people who rise to the challenges in foreign lands and at home – in wartime and in peacetime. The risk of not telling the story is in losing an opportunity to celebrate Canadian greatness and to document the standard for future generations. Buy a tree online or by sending a cheque to the RMR Foundation at 4625 Ste-Catherine St. W. Westmount, QC H3Z 1S4. Receipts for income tax purposes will be issued. Set-up your own personal donation page to raise $1,000 for a tree (instructions below). Encourage your group or association to raise $1,000 for a tree by collecting individual donations. A group of 50 members just needs to contribute $20 each to be able to get a commemoration tree for the group! All donors will receive a receipt for income tax purposes. If you set-up a personal giving page, then all of your donors will also receive their own receipt for income tax purposes for the amount they contributed. How to set-up a Personal Donation Page? If you would like to some help to buy a tree you can easily set-up an online giving page at Canadahelps.org, the online donation service used by the RMR Foundation. This reduces the financial burden on you and allows you to spread the word about the project at the same time. This is a GREAT way for groups & associations to contribute. The entire process will take someone with average computer skills approximately five minutes to complete and requires zero financial outlay. 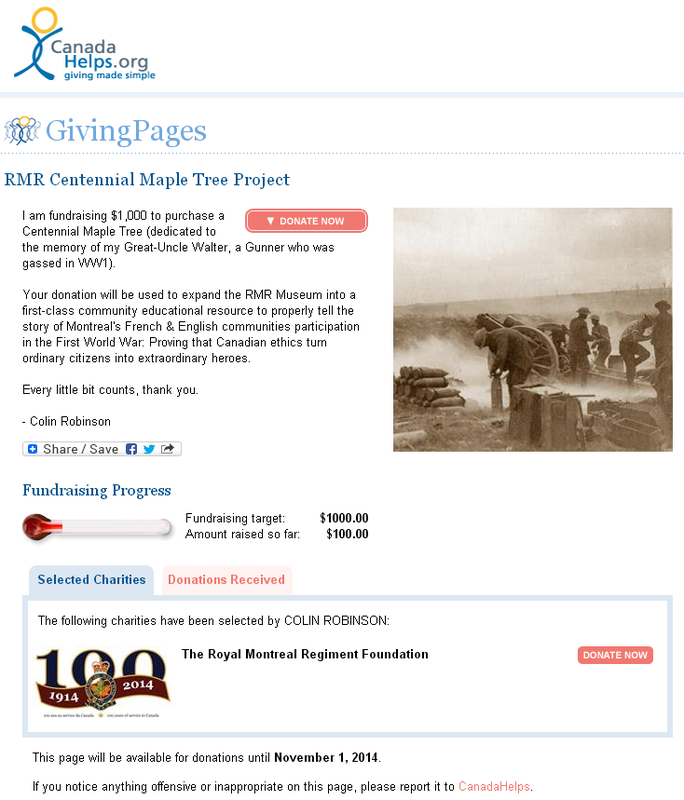 If you have an email address, you can start a personal donation page to support the RMR Centennial Maple Tree project! Step 2: Click “Create a GivingPage” on the right side. Personal Message = Whatever you’d like, but please include a description of the project so that people know what they’re supporting. You are limited to the amount of characters that you can use. 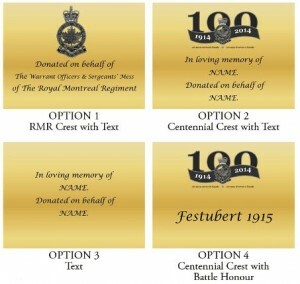 Suggested text: Your donation will be used to expand the RMR Museum into a first-class community educational resource to properly tell the story of Montreal’s French & English communities participation in the First World War: Proving that Canadian ethics turn ordinary citizens into extraordinary heroes. Is the Canadahelps.org site secure? Yes, the RMR Foundation has been using them for more than a year now with no issues, they have been around for 14-years, and they have facilitated more than $300 million dollars in donations for Canadian charities to be raised online. How do people pay? Your site will accept Visa, Mastercard, American Express, and PayPal payments. Will income tax receipts be issued? Yes, the Canadahelps.org site will issue a receipt on behalf of the RMR Foudation to the individual donors that will they can claim on their income taxes. Receipts will be emailed to the donors. What happens when I raise $1,000? You will be contacted by the RMR Foundation to coordinate your personalized plaque for your tree, as well as details about the planting ceremony, museum expansion details, etc.